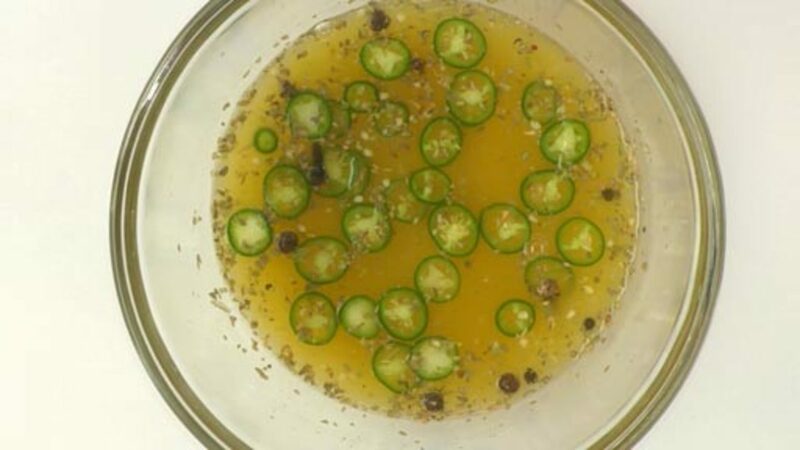 To prepare the marinade, combine the lime juice, orange juice and apple cider vinegar in a medium container. Finely slice the jalapeno into rounds and emince the garlic. Add to the bowl, along with the oregano, salt and sugar. Stir to dissolve the salt and sugar. Toast the spices over medium-low heat until fragrant. Add to the bowl and stir to combine. Season the marinade to taste, adding more citrus, spices or sugar, as desired. Set aside. Peel the onions and slice into 1/4" -inch rounds. *Note: Small red onions work well for this recipe as the rings will be a nice size once sliced. Set up an ice bath. Bring a medium pot of water to a boil. Blanch the onions for approximately 15 seconds. Transfer to the ice bath to stop the cooking process. Once cool, drain the onions. Add the onions to the marinade and toss to combine. Cover and let marinate in the refrigerator for at least 4 hours. During marinating, both the onions and marinade will turn bright pink. These onions will keep for at least a week in the refrigerator. There are many variations of these marinated onions. Some recipes call for sour or Seville oranges. If you can’t find these, you can substitute with 2 parts lime juice to 1 part orange juice. You can also experiment different amounts of spices and citrus/vinegars such as fresh grapefruit juice or apple cider vinegar.